Relationships matter in any business. They arguably matter more in consulting, where competition has increased over the last decade as firms battle to capture a market once owned by the Big Eight professional services companies. Now that "eight" has become "four," agile newcomers like Chicago-based Huron Consulting Group occupy a more prominent role. But doing so demands technical acumen and the people skills to forge relationships inside and outside a fast-growing company. "What has evolved in the last 10 or 15 years is firms like us: smaller, very focused, very high-value," says Mukesh Gangwal '84. He is a managing director in Huron's healthcare practice, a "huge focus" for the company, which also offers a diversified portfolio of services across industries. Consulting has been a market-facing business, says the former Arthur Andersen partner, but now clients demand even more. "Not only do you need to be uniquely qualified to the segment you are serving, but the market is looking for you to be a trusted adviser," says Gangwal, citing the Kellogg School's team-oriented environment as providing critical holistic tools for modern consulting. "It's not only technical skills that are important. It is also the softer skills that build trust based on integrity." That combination has served Huron well since being launched in 2002 by a core of former Andersen talent, including Gary E. Holdren, current chairman, president and CEO. Huron has built its business from 213 people and $35 million in revenues to one that today boasts more 1,200 employees in 11 U.S. cities and a Tokyo office. Revenues now top $285 million. Huron went public in October 2004 and has attracted attention: Entrepreneur magazine ranked the firm No. 1 on its Hot 100 list for 2005 and 2006, while BusinessWeek placed it at No. 22 on its Hot 100 Growth Companies for 2007. Consulting Magazine has called the company one of the 10 best to work for and Modern Healthcare regards Huron as No. 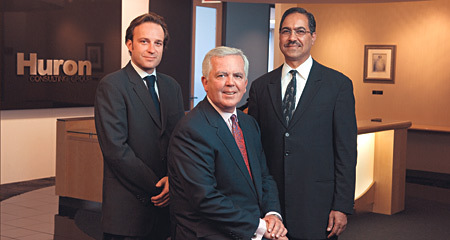 3 on its 2007 list of the largest healthcare management consultants. It has made several strategic acquisitions, such as earlier this year with healthcare strategic specialist Wellspring Partners. Growth is good, says Holdren, but it's not the only thing. The goal is creating a sustainable enterprise that delivers great client results while staying engaged with the community and its employees. Achieving this means establishing a strong corporate culture around the idea that "individuals go fast and teams go far," says Holdren, who sets a community-spirited example by serving on the boards of several Chicago organizations, including the Lyric Opera, Children's Memorial Hospital and the Economic Club. "The question is," he says, "can you put all these really smart 'A-type' people together and give them the incentive that makes them want to achieve something as a team that is worth more than their individual accomplishments?" Yes, if the right core values drive the organization. Holdren says Huron's entrepreneurial and team culture sets it apart from other firms whose credo is "eat what you can kill." "There are organizations like that. That's one culture. That's not my training or background," he adds, referencing the values of his father, an auto parts entrepreneur, who taught him "that if you don't treat your people and clients well, you have nothing." He adds: "I'm talking about principles. It doesn't mean that we don't really push our people to make sales." Huron employs several Kellogg graduates, suggesting that the school's team-focused approach offers value. Paul Saias '94, another Huron managing director in the firm's corporate consulting practice, says his Kellogg skills have proven foundational. "The key in consulting remains your ability to put the best team in front of your client," says the former A.T. Kearney consultant. For him, the diverse Kellogg student body and the school's academics made his MBA experience "a great learning ground." In consulting, getting along with a variety of people is essential, since you may be working together on a project for months, Saias adds. Also prized is keen analytical ability. "The job comes down to thinking about very complex issues and sorting them in a short time, often with imperfect information," he says. "You typically cannot solve the client's problem unless you can rely upon other people in your team and across Huron." Huron's CEO aims to continue the firm's relationship with the community, including the Kellogg School, which he calls "a great institution," one whose graduates seem well suited to the Huron culture. "We really take pride in the kind of people we're attracting," says Holdren.